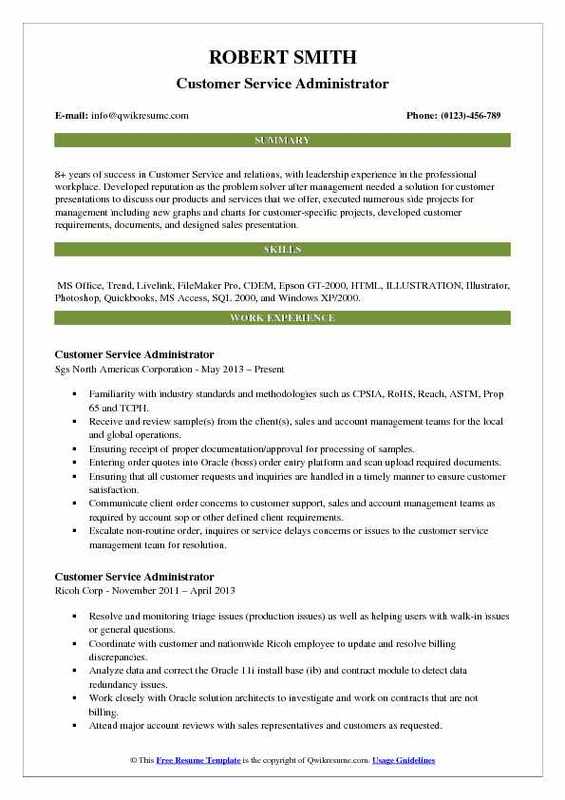 Customer Service Administrator’s main job is to provide assistance to the customers either directly or through phone calls, coordinate customer service staffs, ensure that customer needs are satisfied and develop an organized customer service policy. 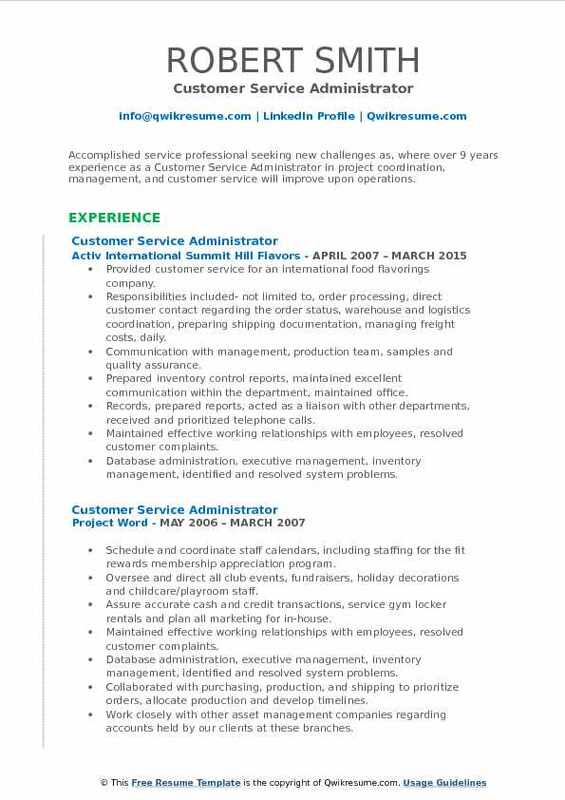 The other typical duties listed in the Customer Service Administrator Resume sample are responding to inquiries, taking calls, solving issues related to customer orders, handling delivery of orders, suggesting alternative products, handling major incidents, investigating issues and promoting discounts. Some of the best Customer service Administrator resumes should showcase chief assets like customer focus, teamwork, time management, telephone etiquette, multitasking, good listening skill and proactive. Even though a formal education is not demanded by the hiring employers, showcasing a Bachelor’s degree or general education diploma signifies to be a major plus. Headline : A seasoned Customer Service Administrator with 6+ years of experience is seeking a position in a fast-paced healthcare environment, that will allow me to grow and strengthen my knowledge. Skills : Quality Assurance, Organizational / Self Starter, Customer Service, MS Word, MS Outlook, Excel, Windows Livelink, FileMaker Pro., CDEM, Archived Legal Corporate Records And Drawing, Epson GT-2000, KIP 3100 Documents Scanner. Responsibilities to Greet, assist and screen visitors; maintenance of the reception area. Answering phones, refer calls appropriately and manage main phone lines. Managing the reservation process for conference room and assist in scheduling meetings. Maintenance of office supplies, equipment, and repair of equipment’s (copier, photocopier, etc.). Data entry in the office trend system, add freight to the customer, verifies that (POD) proof of delivery has been shipped and invoiced (in trend). Able to bring productive energy, accuracy, and enthusiasm to both individual and group projects. Able to analyze a problem/situation, and strategically plan to achieve the best possible solutions. Investigating customer issues, managing on-demand projects, assisting customer care representatives, working directly with the Customer Care Manager, maintain internal forms, draft work instructions for company policies/procedures. 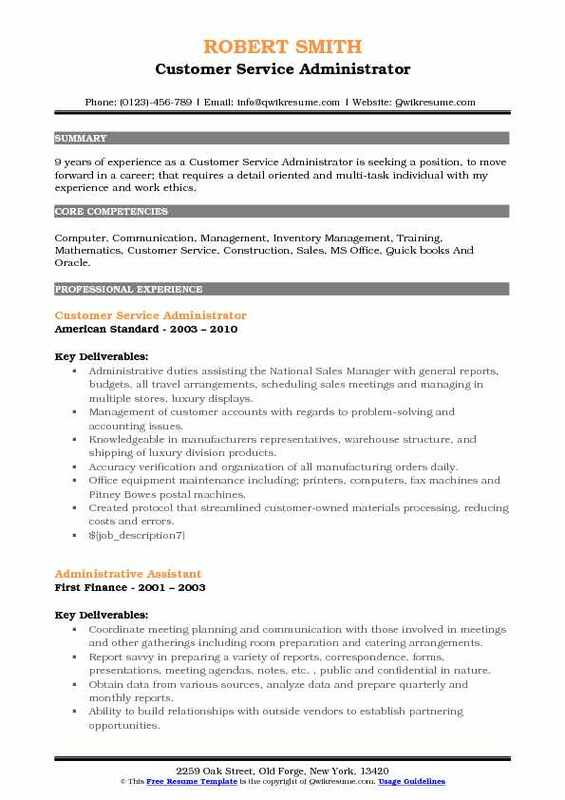 Objective : 2 years of experience as a Customer Service Administrator is now looking is to obtain employment with a company that allows me to utilize my experience in customer service and leadership to assist both parties to grow with the changing business climate. Skills : Internet, Outlook, Word, Excel, Data Entry, Customer Service, Administrative, Recruiting, Human Resources And Payroll. Enrolled applicants into our database management system, gather information and enter data into our customized computer program. Daily maintenance of applicant database documenting all activity for each applicant. Worked with colleges and universities to recruit quality students for client opportunities. Human resources handling all aspects of employer/employee relationships, performed in-depth interviews to assess applicants work history and skills to determine potential positions matching their experience. Scheduled and maintained office calendar for enrollment, interviews, background investigations and follow up, drug test appointments and follow up workers compensation claims and follow up, unemployment claims and follow up, court hearings, internal and external appointments and meetings. Prepared court dockets and case files for workers compensation and unemployment claims via jury and non-jury trials, hearings, and motions. Created background information profiles to enter all required data into the appropriate form fields to obtain a full background report identifying key areas required for employment, examples of required information were felonies, misdemeanors, employment history, education verifications, references, etc. Would continue to check background status of investigation for results and/or pending information required to complete the background cycle, upon completion would receive and review documents to determine background eligibility dealing with all required criteria. Performed in-house drug tests to determine the eligibility of employment as well as completed necessary forms for employees to go to lab facilities to complete their drug screens. Would evaluate in-house drug test and lab results to determine whether the results met hiring criteria and would handle accordingly. Summary : 8+ years of success in Customer Service and relations, with leadership experience in the professional workplace. Developed reputation as the problem solver after management needed a solution for customer presentations to discuss our products and services that we offer, executed numerous side projects for management including new graphs and charts for customer-specific projects, developed customer requirements, documents, and designed sales presentation. Skills : MS Office, Trend, Livelink, FileMaker Pro, CDEM, Epson GT-2000, HTML, ILLUSTRATION, Illustrator, Photoshop, Quickbooks, MS Access, SQL 2000, and Windows XP/2000. Familiarity with industry standards and methodologies such as CPSIA, RoHS, Reach, ASTM, Prop 65 and TCPH. Receive and review sample(s) from the client(s), sales and account management teams for the local and global operations. Ensuring receipt of proper documentation/approval for processing of samples. Entering order quotes into Oracle (boss) order entry platform and scan upload required documents. Ensuring that all customer requests and inquiries are handled in a timely manner to ensure customer satisfaction. Communicate client order concerns to customer support, sales and account management teams as required by account sop or other defined client requirements. Escalate non-routine order, inquires or service delays concerns or issues to the customer service management team for resolution. Transmit complete sample job folder to customer service administration team for processing. Managing the global network activity to ensure, SOP compliance and prompt and accurate response to client inquiries or assignments. Facilitate and maintain both an effective communication and coordination system with the respective SGS, CTS Director global key accounts as well as other colleagues regarding rate structures, order handling routine, customer performance analysis etc. Assist to reduce past due to invoices and get payment from the client with support from client services team. Summary : Accomplished service professional seeking new challenges as, where over 9 years experience as a Customer Service Administrator in project coordination, management, and customer service will improve upon operations. 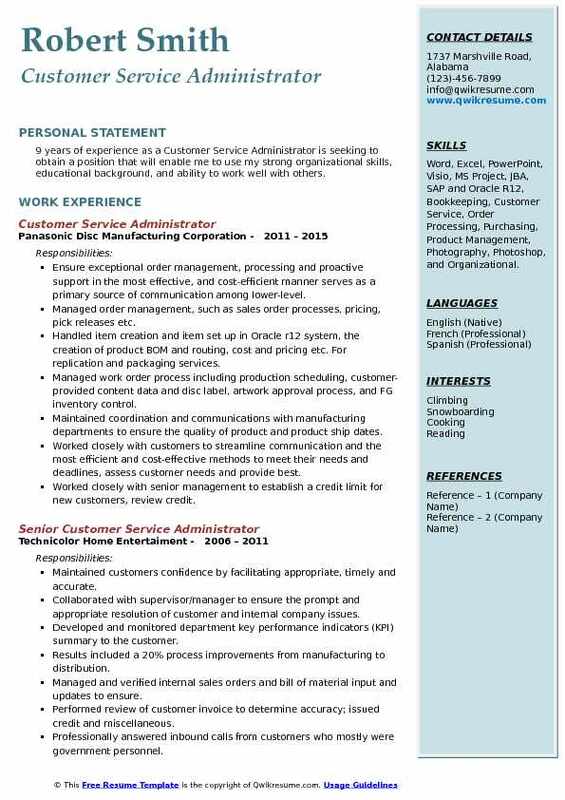 Skills : Microsoft Office Suite, Customer Relationship Management, Computer, Communication, Management, Inventory Management, Training, Mathematics, Customer Service, And Construction. Provided customer service for an international food flavorings company. Responsibilities included- not limited to, order processing, direct customer contact regarding the order status, warehouse and logistics coordination, preparing shipping documentation, managing freight costs, daily. Communication with management, production team, samples and quality assurance. Prepared inventory control reports, maintained excellent communication within the department, maintained office. Records, prepared reports, acted as a liaison with other departments, received and prioritized telephone calls. Maintained effective working relationships with employees, resolved customer complaints. Database administration, executive management, inventory management, identified and resolved system problems. Proficiently navigate Microsoft office software tools including access excel OneNote outlook powerpoint. 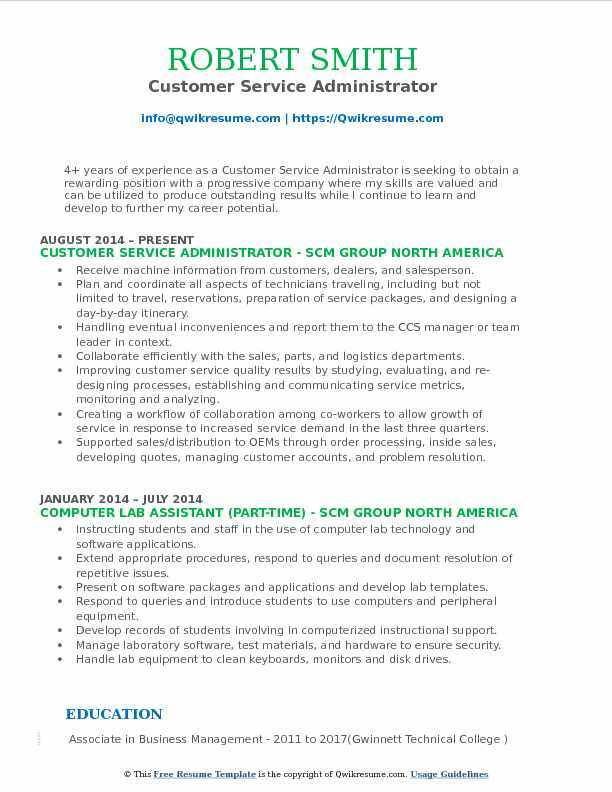 Summary : 9 years of experience as a Customer Service Administrator is seeking to obtain a position that will enable me to use my strong organizational skills, educational background, and ability to work well with others. Skills : Word, Excel, PowerPoint, Visio, MS Project, JBA, SAP and Oracle R12, Bookkeeping, Customer Service, Order Processing, Purchasing, Product Management, Photography, Photoshop, and Organizational. Ensure exceptional order management, processing and proactive support in the most effective, and cost-efficient manner serves as a primary source of communication among lower-level. Managed order management, such as sales order processes, pricing, pick releases etc. Handled item creation and item set up in Oracle r12 system, the creation of product BOM and routing, cost and pricing etc. For replication and packaging services. Managed work order process including production scheduling, customer-provided content data and disc label, artwork approval process, and FG inventory control. Maintained coordination and communications with manufacturing departments to ensure the quality of product and product ship dates. Worked closely with customers to streamline communication and the most efficient and cost-effective methods to meet their needs and deadlines, assess customer needs and provide best. Worked closely with senior management to establish a credit limit for new customers, review credit. Worked closely with it to simplify processes and to ensure the accuracy of system entries for better efficiency and quality, establish new procedures for the department. Summary : 21+ years successful experience as a Customer Service Administrator with recognized strengths in account maintenance, problem-solving and troubleshooting, account management staff support, and planning/implementing proactive procedures and systems to avoid problems in the first place. Skills : Customer Service/Support, Supervisory/Management Of Staff, Brand Development, Communication, Power Tools, And Training. Provide excellent customer service and support for high volume inbound/outbound calls and reply through e-mail that negates return callbacks. Develop strong rapport with inter-departments and technicians that facilitate open communications for quick resolve on customer issues. Ensure knowledge of current system updates and provide professional administration of all company policies and procedures. Working with several account managers covering the Potomac regional to include 4 states (Washington DC, VA, MD, NJ), support account managers in opening new accounts and upgrading existing service. Maintaining quality control/satisfaction records, constantly seeking new ways to improve customer service. Research issues for carriers, disconnect in errors, billing for circuits that do not belong to them, busy CFAS. Processing meet point orders and exchanged with the other LECs (local exchange carrier service). Additionally processing orders for these low to high bandwidth services. Working on special report orders and minimal process rolls die and creating orders manually. 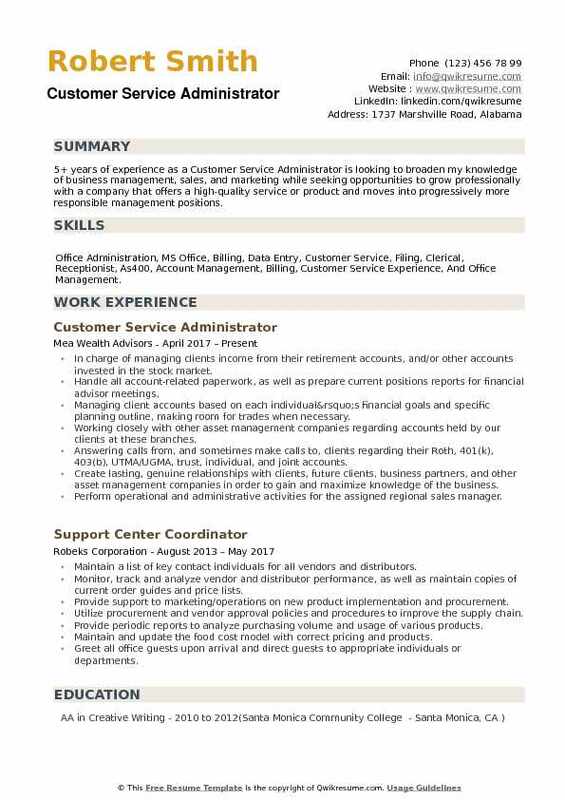 Objective : 4+ years of experience as a Customer Service Administrator is seeking to obtain a rewarding position with a progressive company where my skills are valued and can be utilized to produce outstanding results while I continue to learn and develop to further my career potential. 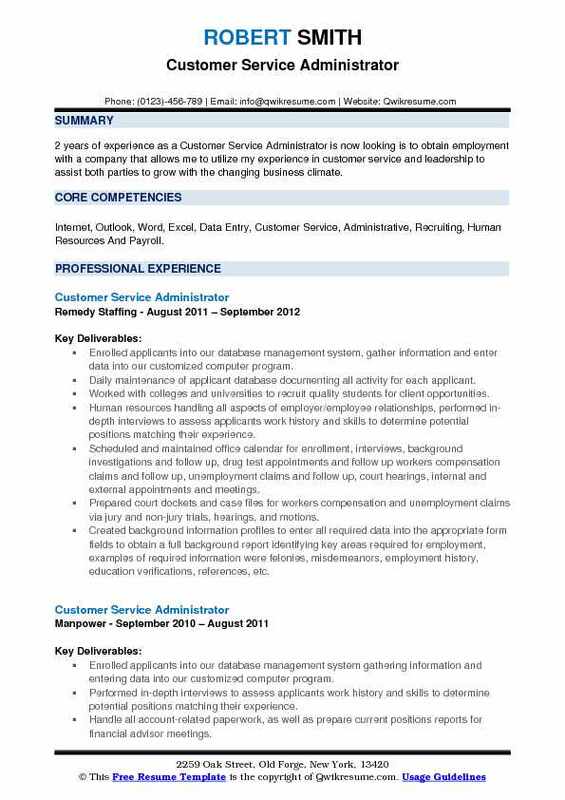 Skills : Excel, Microsoft Word, Outlook, PowerPoint, Office Administration, Billing, Data Entry, And Customer Service. Receive machine information from customers, dealers, and salesperson. Plan and coordinate all aspects of technicians traveling, including but not limited to: travel, reservations, preparation of service packages, and designing a day-by-day itinerary. Handling eventual inconveniences and report them to the CCS manager or team leader in context. Collaborate efficiently with the sales, parts, and logistics departments. Improving customer service quality results by studying, evaluating, and re-designing processes, establishing and communicating service metrics, monitoring and analyzing. Creating a workflow of collaboration among co-workers to allow growth of service in response to increased service demand in the last three quarters. Supported sales/distribution to OEMs through order processing, inside sales, developing quotes, managing customer accounts, and problem resolution. 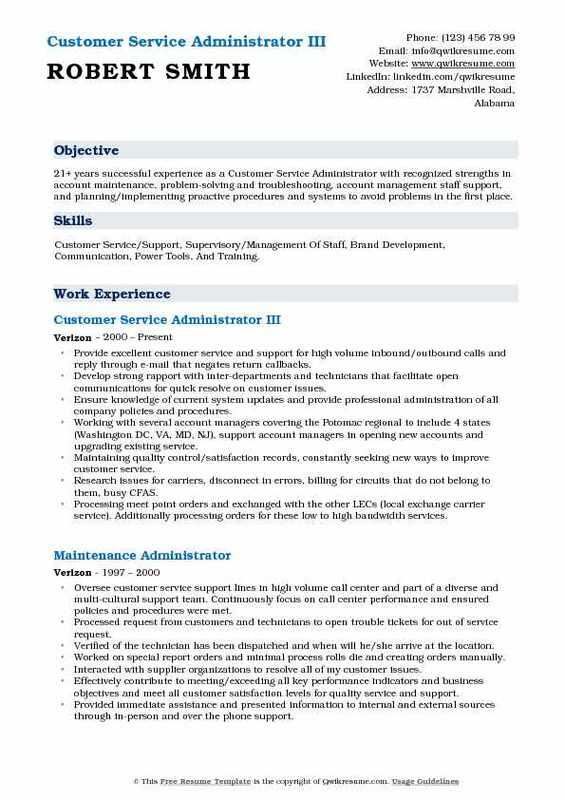 Summary : 9 years of experience as a Customer Service Administrator is seeking a position, to move forward in a career; that requires a detail oriented and multi-task individual with my experience and work ethics. 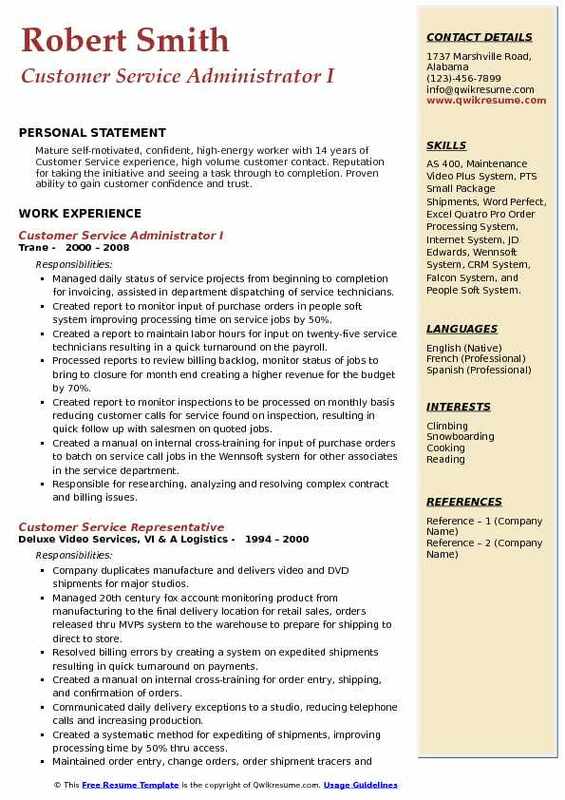 Skills : Computer, Communication, Management, Inventory Management, Training, Mathematics, Customer Service, Construction, Sales, MS Office, Quick books And Oracle. Administrative duties assisting the National Sales Manager with general reports, budgets, all travel arrangements, scheduling sales meetings and managing in multiple stores, luxury displays. Management of customer accounts with regards to problem-solving and accounting issues. Knowledgeable in manufacturers representatives, warehouse structure, and shipping of luxury division products. Accuracy verification and organization of all manufacturing orders daily. Office equipment maintenance including; printers, computers, fax machines and Pitney Bowes postal machines. Created protocol that streamlined customer-owned materials processing, reducing costs and errors. Summary : Mature self-motivated, confident, high-energy worker with 14 years of Customer Service experience, high volume customer contact. Reputation for taking the initiative and seeing a task through to completion. Proven ability to gain customer confidence and trust. Skills : AS 400, Maintenance Video Plus System, PTS Small Package Shipments, Word Perfect, Excel Quatro Pro Order Processing System, Internet System, JD Edwards, Wennsoft System, CRM System, Falcon System, and People Soft System. Managed daily status of service projects from beginning to completion for invoicing, assisted in department dispatching of service technicians. Created report to monitor input of purchase orders in people soft system improving processing time on service jobs by 50%. Created a report to maintain labor hours for input on twenty-five service technicians resulting in a quick turnaround on the payroll. Processed reports to review billing backlog, monitor status of jobs to bring to closure for month end creating a higher revenue for the budget by 70%. Created report to monitor inspections to be processed on monthly basis reducing customer calls for service found on inspection, resulting in quick follow up with salesmen on quoted jobs. Created a manual on internal cross-training for input of purchase orders to batch on service call jobs in the Wennsoft system for other associates in the service department. Responsible for researching, analyzing and resolving complex contract and billing issues. 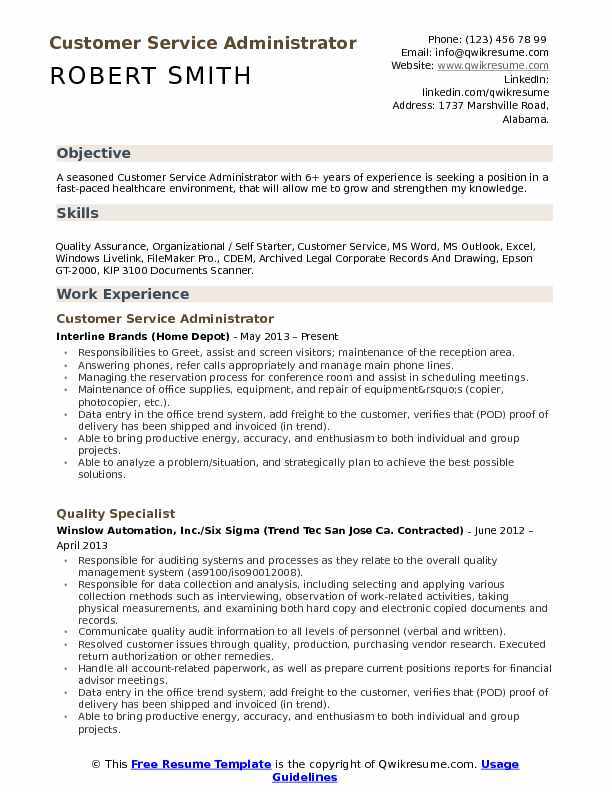 Objective : 5+ years of experience as a Customer Service Administrator is looking to broaden my knowledge of business management, sales, and marketing while seeking opportunities to grow professionally with a company that offers a high-quality service or product and moves into progressively more responsible management positions. Skills : Office Administration, MS Office, Billing, Data Entry, Customer Service, Filing, Clerical, Receptionist, As400, Account Management, Billing, Customer Service Experience, And Office Management. In charge of managing clients income from their retirement accounts, and/or other accounts invested in the stock market. Handle all account-related paperwork, as well as prepare current positions reports for financial advisor meetings. Managing client accounts based on each individual’s financial goals and specific planning outline, making room for trades when necessary. Working closely with other asset management companies regarding accounts held by our clients at these branches. Answering calls from, and sometimes make calls to, clients regarding their Roth, 401(k), 403(b), UTMA/UGMA, trust, individual, and joint accounts. Create lasting, genuine relationships with clients, future clients, business partners, and other asset management companies in order to gain and maximize knowledge of the business. Perform operational and administrative activities for the assigned regional sales manager.